July 20th, 2003: Not a bad day, though beach lovers might complain it is too cool. I think the temperature might have reached 23° with alternating cloud and sun, and a stiff wind. 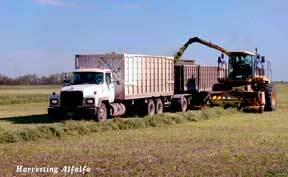 It was harvest time at the Crawford household today. We cleaned off the gooseberry, pincherry, and red currant bushes, and picked about a pail full of saskatoons. The saskatoons are about at the end of their season, with lots more withered berries than green ones, but still worth picking. We cleaned them all, then Doreen extracts the juice and makes jellies out of them. The saskatoons are just bagged and frozen, we still have lots left over from two years ago, so don’t have to pick as many. berries The gooseberries are lovely and thick, and they look pretty nice once we wash the blood off of them. I have a notion the branches should be thinned out; reaching in to the center is dangerous to your health. Another week of wandering! This time we went to Nipawin, Lower Fishing Lake, and Candle Lake, in three nights and four days. 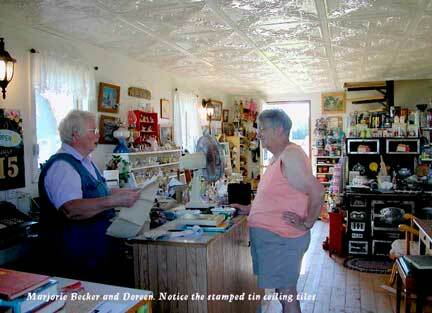 We checked out museums at Tisdale, Nipawin, and Kinistino, three good ones, well worth stopping in. 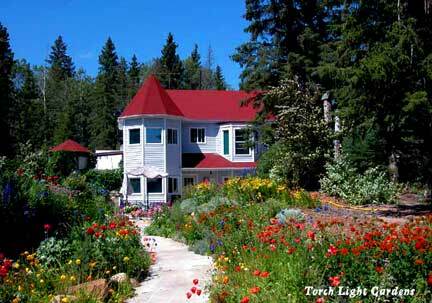 Of particular interest were the two pioneer homes at Tisdale, one a little four-room house and the other the two storey, four-bedroom Pearse house. 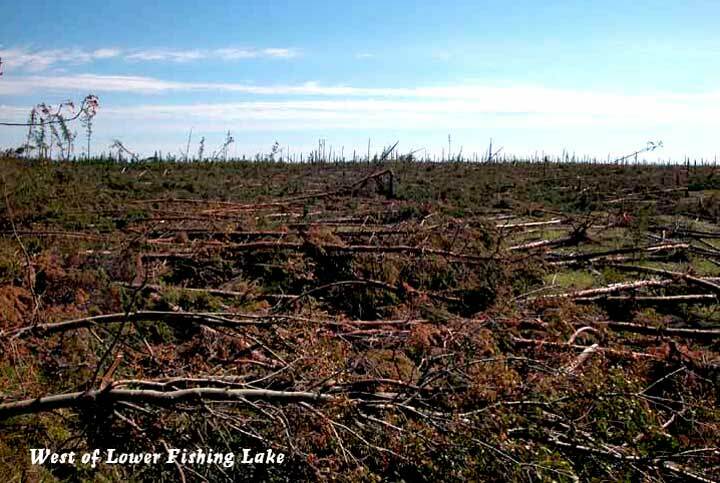 Nipawin’s had to do with the forestry industry; it covered a lot of ground besides its main building. Kinistino’s was compact, in a former school building, and had a lot of old photos and clippings well displayed. 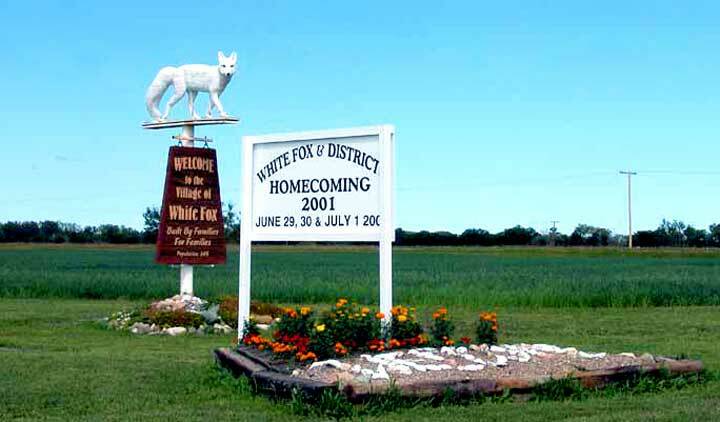 The town got its start about 1903, and the railroad went through in 1905; it was a pretty important town in its day. Beckers At Codette, we noticed a small “Antiques” sign pointing west, so we followed it, four miles west and three miles south we found Becker’s Barn, Antiques, Collectibles, & More. It’s actually three small barns, built for the purpose, plus two long granaries of four rooms each, all filled with antiques. Completely different from the average Antique store, these rooms were spotless; the antiques were cleaned up and some were painted. 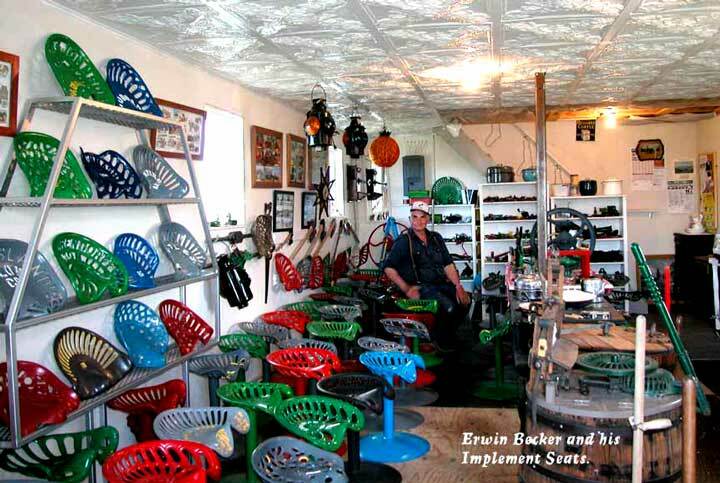 Erwin Becker’s forte is cast iron implement seats; he cleans them up, paints them, and mounts them on a pedestal, making very comfortable stools. He belongs to a Cast Iron Seat Collector’s Association, and collects them from all over the continent. One barn was half full of them. We had a great conversation with the Beckers, and swapped web page addresses. Theirs is e.becker@sasktel.net. Check it out! 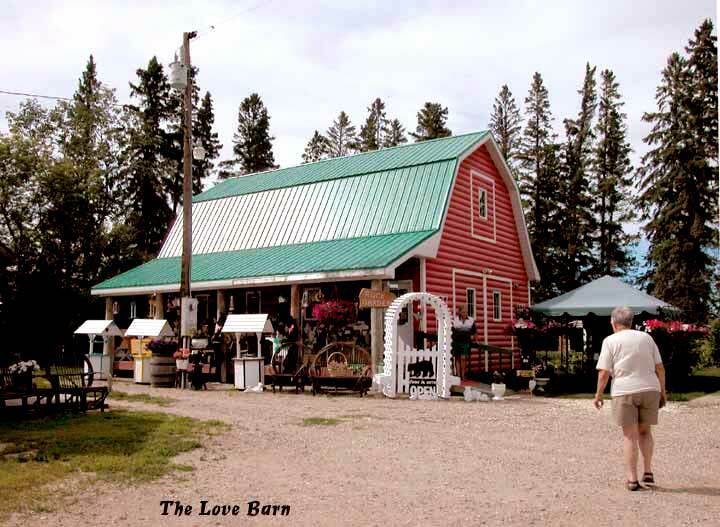 From there we went to Love, and checked out the Love Barn, crafts and antiques. 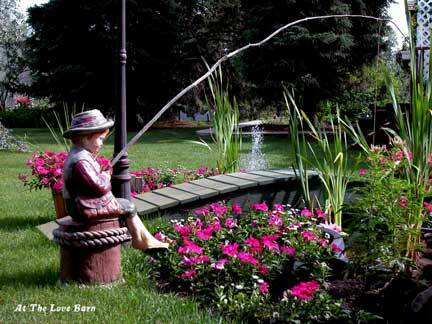 It is surrounded by a beautifully landscaped yard and offers local crafts and giftware. I was surprised at the large number of Dorothy Wark’s art cards. Dorothy is a member of Parkland Photography Club, and does beautiful work. When we left Lower Fishing Lake, we went west on Highway #120. 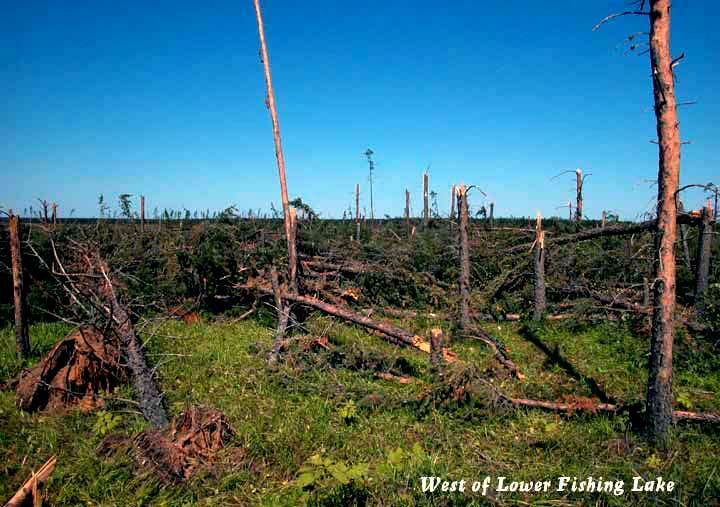 A few miles west of the junction with #106, the forest was absolutely devastated, it looked as if a hundred big D-8 Cats had walked down the forest. Where the trees were not knocked flat or splintered, they were canted at between 30° and 60°, all leaning towards the east. The strip must have been a good mile wide and several miles long and we assume was caused by a plow wind when that awful storm went through the area three weeks ago. 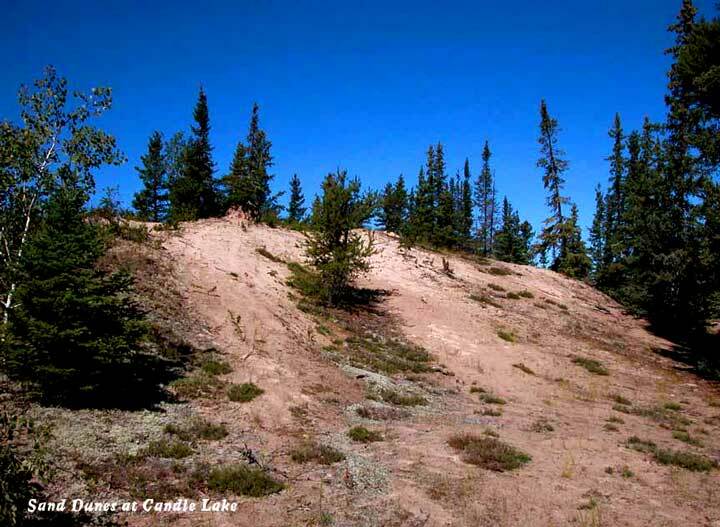 At Candle Lake, we were impressed by the sand dunes at Minowukah Beach. They are made up of very fine sand (I guess it would have to be, to blow in the wind) and must be a hundred feet above the level of the lake. Some vegetation has taken root, but not where there is any traffic. 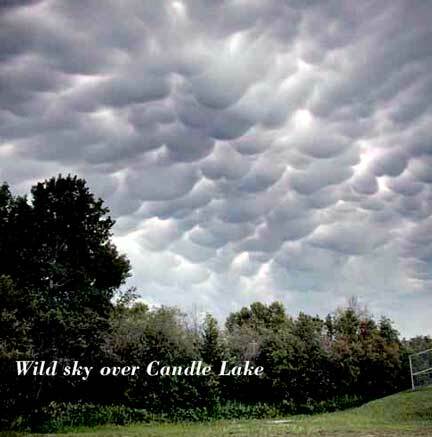 The night before we left Candle Lake, the sky clouded over with heavy, dark clouds, with puffs coming down out of them. 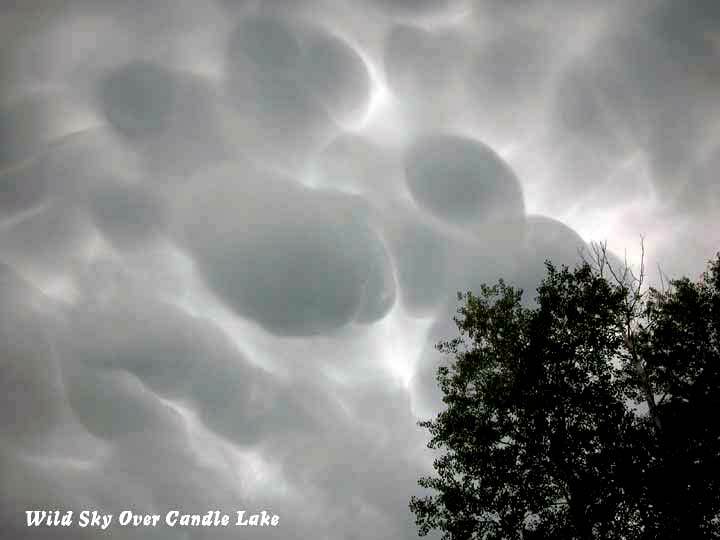 Very strange, and ominous. At the same time it started to thunder, but all we got was a very brief shower. 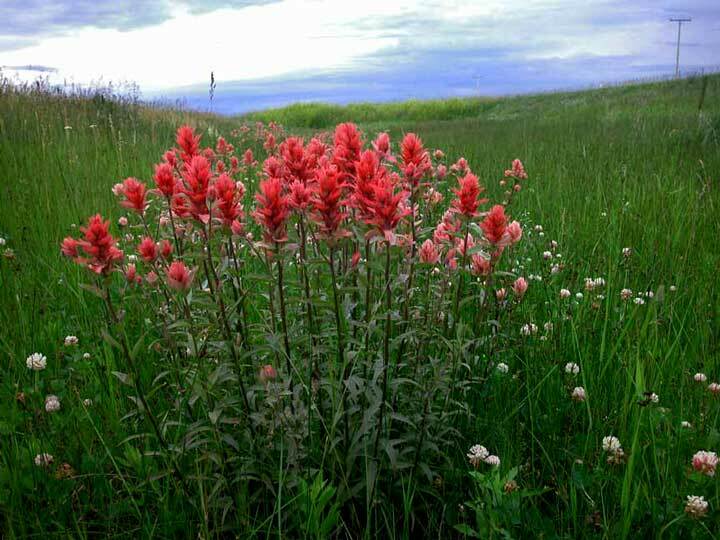 flowers On our trip home from Saskatoon week before last, we were amazed at the Indian paintbrush (above) in the south ditch, between Englefeld and Muenster. We have never seen them growing in such profusion. 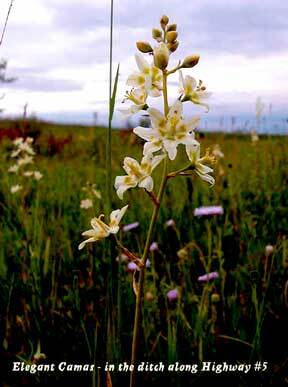 Of course, it meant stopping and crawling around in the ditch taking pictures and while doing that, we came on a tall white flower, identified as elegant camas. 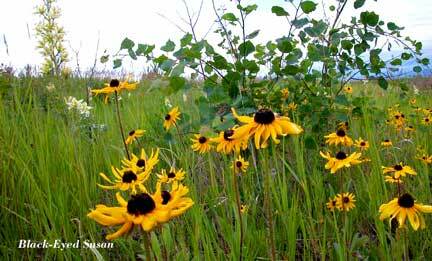 Then, behind some willows and not visible from the highway were some black-eyed Susans, in all their glory. 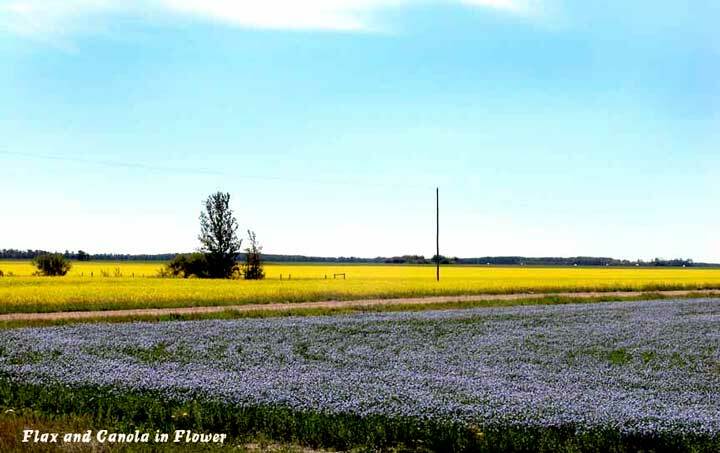 Who says Saskatchewan isn’t colorful?